Founded by William J. Castle in 1983, we are a structural/civil engineering company. We provide structural designs, inspection services, testing, and more to both government agencies and private contractors and companies. For 34+ years, W. J. Castle has been known for its marine engineering expertise. Our team includes Structural and Civil Engineers who offer complete structural designs for building, replacing, or repairing bridges, piers, docks, underwater cables and more. 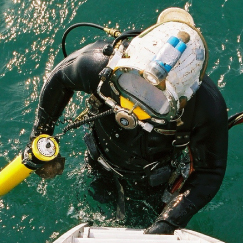 We also employ Engineer-Divers who are proficient at underwater diagnostics and reporting, with the ability to develop repair designs as needed. W.J. Castle, P.E. & Associates, P.C. is a certified SBE and VOSB. Our Company owns two types of sonar imaging equipment. Both have their strengths and uses, but it depends upon the project scope which system would be applicable. Side Scan Sonar System enables us to view large search areas quickly and produce high-resolution images of the river bottom up to 40 meters from the sonar head. The towfish is rated for 500 feet depth and is equipped with 150 feet of cable. The sonar unit is anchored to the boat and the imaging is collected as the boat is driving through the designated area. The data that is collected is then sent to a laptop computer where it can display a real time color image of the river or ocean bottom. This system works best for evaluating the existing channel bottom conditions, construction inspection, or recovery operations. Some of the potential uses are as follows: verify existing debris, verify debris removal, scour countermeasures installed, or search and recovery. 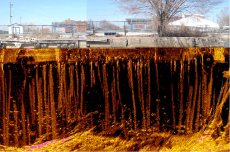 Scanning Sonar Imaging has the ability to detail the channel bottom and scan a vertical structure such as a pier, dam, or bulkhead. The sonar is placed into position either directly on the channel bottom for scanning the bottom or attached to a pole or bracket and lowered into position to scan the vertical surface. The sonar unit sends out a sound wave which bounces back from the structure or obstacle and is then transmitted as a picture and/or video to the computer on the topside. A video recording is saved which may later be used to develop a still picture of the area. The scans taken with this unit have to be stationary and multiple scans can then be mosaic together. This system is best used for high resolution imaging structures and the surrounding channel bottom. This can also be used for construction inspection, as a supplement for underwater inspection, or as part of a scour evaluation program.